Get outdoors at Kovalam Beach and Lighthouse Beach. Do your shopping at The Art of India and Ramachandran Textiles. Explore Thiruvananthapuram (Trivandrum)'s surroundings by going to Varkala (Moon Stone Arts, Varkala Beach, & more). There's more to do: contemplate in the serene atmosphere at Sree Padmanabhaswamy Temple and look for gifts at Keralashopee. To see traveler tips, more things to do, ratings, and more tourist information, refer to the Thiruvananthapuram (Trivandrum) travel itinerary planner. Philadelphia, USA to Thiruvananthapuram (Trivandrum) is an approximately 29-hour flight. Due to the time zone difference, you'll lose 10 hours traveling from Philadelphia to Thiruvananthapuram (Trivandrum). Expect warmer temperatures when traveling from Philadelphia in January; daily highs in Thiruvananthapuram (Trivandrum) reach 87°F and lows reach 74°F. Finish your sightseeing early on the 21st (Sun) so you can travel to Munnar. Start off your visit on the 21st (Sun): pause for some serene contemplation at C.S.I Christ Church, pause for some serene contemplation at Mount Carmel Church, then examine the collection at Tea Museum, and finally admire the natural beauty at Rose Gardens. Keep things going the next day: explore the wealth of natural beauty at Rajamalai (Eravikulam) National Park. To find reviews, maps, other places to visit, and more tourist information, you can read our Munnar travel itinerary planner. Traveling by combination of flight and taxi from Thiruvananthapuram (Trivandrum) to Munnar takes 3 hours. Alternatively, you can drive; or do a combination of train and taxi. Expect a daytime high around 91°F in January, and nighttime lows around 71°F. You will leave for Thekkady on the 23rd (Tue). Start off your visit on the 23rd (Tue): contemplate in the serene atmosphere at Mangala Devi Temple, relax and rejuvenate at some of the top local wellness centers, and then contemplate in the serene atmosphere at Mangladevi Temple. 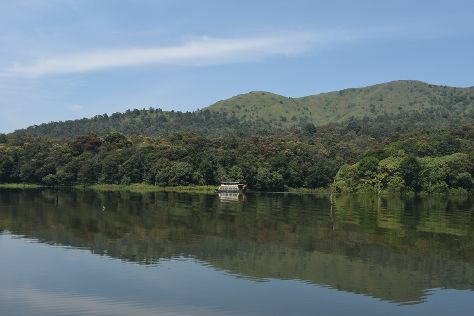 On the 24th (Wed), you'll have a packed day of sightseeing: get some fabulous bargains at Tropical Chocolate Factory, stop by Kerala Crafts, then contemplate the waterfront views at Periyar Lake, and finally identify plant and animal life at Periyar Wildlife Sanctuary. To see more things to do, ratings, where to stay, and other tourist information, refer to the Thekkady trip builder. Traveling by car from Munnar to Thekkady takes 2 hours. You will leave for Mararikulam on the 25th (Thu). Start off your visit on the 25th (Thu): enjoy the sand and surf at Marari Beach. Keep things going the next day: tour the pleasant surroundings at Mararikulam Beach and then look for all kinds of wild species at Kumarakom Bird Sanctuary. For photos, where to stay, ratings, and tourist information, read Mararikulam itinerary builder. Drive from Thekkady to Mararikulam in 4 hours. In January, daytime highs in Mararikulam are 91°F, while nighttime lows are 71°F. Finish your sightseeing early on the 27th (Sat) so you can travel to Kochi (Cochin). Head to LuLu Mall and Kochi Booksfor some retail therapy. Visit Paradesi Synagogue and Church of Saint Francis for their historical value. 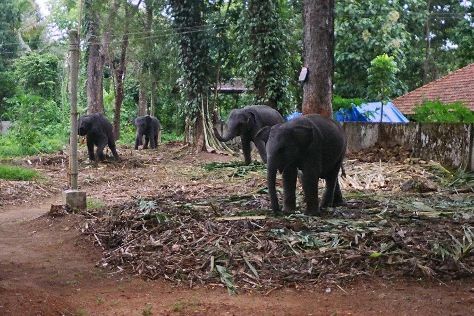 Take a break from Kochi (Cochin) with a short trip to Kodanand Elephant Training Centre in Kodanad, about 1h 25 min away. Next up on the itinerary: take in the exciting artwork at Kashi Art Gallery, stop by Anokhi, explore the galleries of Kerala Folklore Museum, and look for all kinds of wild species at Wildlife Areas. For reviews, other places to visit, where to stay, and other tourist information, go to the Kochi (Cochin) itinerary planner. Traveling by car from Mararikulam to Kochi (Cochin) takes 1.5 hours. In January, daytime highs in Kochi (Cochin) are 90°F, while nighttime lows are 73°F. Finish your sightseeing early on the 1st (Thu) so you can travel to Tirupati. On the 1st (Thu), don't miss a visit to Sri Vekateswara Swamy Temple and then steep yourself in history at Tirumala Temple. For ratings, traveler tips, other places to visit, and other tourist information, refer to the Tirupati itinerary maker. Getting from Kochi (Cochin) to Tirupati by flight takes about 5.5 hours. Other options: drive; or take a train. Traveling from Kochi (Cochin) in February, plan for little chillier nights in Tirupati, with lows around 70°F. Finish your sightseeing early on the 2nd (Fri) so you can travel back home.